Background: Frequency analysis of metastasis in patients with oral squamous cell carcinoma (OSCC) helps to partly anticipate the upcoming chance of metastasis in the patients following primary diagnosis. This study was conducted to determine the evaluation of metastasis and 5-year survival in OSCC. Materials and Methods: This was a retrospective, descriptive study. A total of 96 OSCC patients were studied. Demographic data and clinical view of lesion as well as histopathological grade of patients were recorded in previously prepared forms of pathology centers. These findings were then evaluated in relation to the 5-year survival. The obtained data were fed into SPSS and analyzed by Chi-square test, t-test, one-way ANOVA, and Scheffé test. A significant level of α = 0.05 was used. Results: The 5-year survival of patients was 41.7%. From among the patients, 44% were found to have local recurrence and 36% were reported to have distant metastasis. There was no significant association between the 5-year survival rate and primary grade (P = 0.105). However, it revealed a significant relationship between the 5-year survival rate and distant metastasis (P = 0. 001). Conclusion: This study showed that the 5-year survival is dependent on the primary site of involvement, local recurrence, regional and distant metastasis, and mean age. However, gender (P = 0.89), grade (P = 0.105), and stage (P = 0.242) have no effect on the 5-year survival of patients. Oral squamous cell carcinoma (OSCC) is the sixth and fifteenth common cancer in men and women, respectively. It involves approximately 94% of all oral malignancies. The etiology of this disease is multifactorial, and no single factor has ever been considered for it. Considering its clinical view, it is observed in the elderly with low socioeconomic status. OSCC is able to invade the underlying bone and involve the nerves. Metastatic spread of this disease greatly affects the 5-year survival of patients, and about 50% of patients with head-and-neck SCC undergo recurrence and metastasis in the first 2 years of their life. This metastatic spread is mostly done through lymphatics to the cervical lymph nodes of the same side of the face. Further, extracapsular extension in some patients is followed by poor prognosis, including increased risk of regional recurrence, distant metastasis, and reduced survival rate. Occasionally, metastatic spread to the lymph nodes of the corresponding side or both sides is also observed, and at least 2%–22% of patients have shown metastasis to supraclavicles during diagnosis. The most common distant metastatic sites in OSCC include lungs, liver, and bones; however, other parts of the body may get involved too. Metastasis is not an early finding about oral carcinomas. Nevertheless, about 21% of patients have been found to have neck metastases due to delayed diagnosis. Tumors originating from more posterior areas in the oropharynx are prone to early metastasis. Oral cancer metastasis is a complex process that involves isolation of tumoral cells from each other, their proliferation and growth, escaping through the lymphatic vascular system, and positioning in different parts of the body. Tumoral cells with metastatic ability undergo certain genetic mutations in the first stage, which is in favor of the movement ability and metastasis of these cells, as these cells lose their intercellular adhesion ability and acquire the ability to pass through intercellular spaces during epithelial–mesenchymal transition process by transforming from squamous to spindle cell. Finally, metastases of OSCC are divided into regional and distant metastases, which can be diagnosed by such methods as positron emission tomography, magnetic resonance imaging, computed tomography, ultrasound, and fine-needle aspiration. This study was aimed to determine the frequency of metastasis and survival rate in patients with OSCC during 2001–2015. The results are hoped to help to partly anticipate the chance of future metastasis after primary diagnosis, to prevent metastasis as much as possible, and to enhance the 5-year survival in patients by applying acceptable treatment methods. In this retrospective, descriptive study (Ethical Code:23810201942038), 96 files of patients with OSCC, from 2001 to 2015, were obtained from the Department of Oral and Maxillofacial Pathology at Isfahan University of Medical Sciences. The files contained exact data [Figure 1], including demographic information [Table 1] and clinical, histopathologic, and radiographic findings, with at least 5 years after primary diagnosis, that is, their primary diagnosis had been made before 2011. First, letters of introduction were obtained from Islamic Azad University of Khorasgan Branch and Isfahan University of Medical Sciences. The OSCC patients' files containing personal information, age, gender, and lesion site during 2001–2015 were extracted from the archive. The patients were called to get their agreement for cooperation in the study and completing the informed consent form [Figure 2]. Further, patient information (primary site, survival rate, recurrent regional or distant metastasis) until 2015 were evaluated with their records at the Oncology Center. The obtained data were then classified and statistically analyzed by Chi-square test, t-test, one-way ANOVA, and Scheffé test. Figure 2: The informed consent form. A significant level of α = 0.05 was used. The minimum and maximum ages of patients were 25 and 83 years, respectively. A total of 22 (42.3%) men had survived and 30 (57.6%) men had died in the past 5 years. Of women, 18 (40.9%) had survived and 26 (59.09%) had died in the past 5 years. The 5-year survival rate of patients was 41.7%. The results of Chi-square test showed no significant difference between men and women in terms of 5-year survival rate (P = 0.89). Among the patients, 44 (45.8%) of them had local recurrence, 44 (45.8%) had regional metastasis, and 36 (37.5%) had distant metastasis. Furthermore, 46.2 (24%) men had regional metastasis and 45.5 (20%) women had regional metastasis. Moreover, 34.6 (18%) men and 40.9 (18%) women had distant metastasis. The results of Chi-square test also indicated no significant relationship between gender and regional metastasis (P = 0.94) and distant metastasis (P = 0.52). Moreover, the findings of Chi-square test showed no significant association between the 5-year survival rate and grade (P = 0.242) of disease. However, Chi-square test revealed a significant relationship between distant metastasis and 5-year survival of patients (P = 0. 001) [Table 1] and [Table 2]. 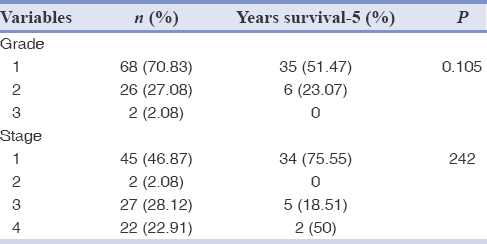 Furthermore, the results of Chi-square test indicated a significant relationship between the primary site of lesion and 5-year survival rate (P = 0.01) [Table 1] and [Table 2]. To find out the location of difference in terms of age, post hoc Scheffé test was run, which indicated a significant relationship between the patients with tongue and gingival lesions. OSCC is one of the most prevalent cancers among women and men. The retrospective analyses done on these patients indicate that the survival of some of them is similar to normal people and some die shortly after being affected by the disease. The present study was aimed to evaluate the 5-year survival of OSCC patients and its relationship with age, gender, stage and microscopic grade, and process of disease. In OSCC, regional metastases occur more than distant metastases.,, In the present study, 45% of regional metastases and 37% of distant metastases showed that the 5-year survival of patients was affected in all cases. In this study, all cases showed a significant relationship between regional metastases and distant metastases by the 5-year survival of patients. 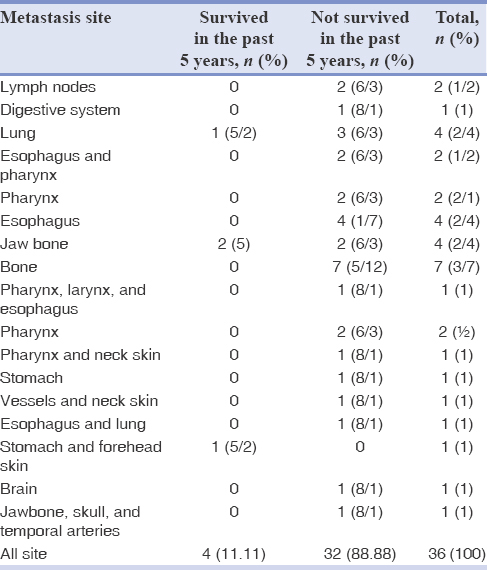 The metastatic sites occurring during OSCC in the study samples included lymph nodes, digestive system, pharynx, esophagus, stomach, lung, throat, jaw bone, larynx, neck vessels and skin, forehead skin, skull, brain, and temporal arteries [Table 3]. As for the primary site of lesion and distant metastasis site in the present study, no significant association was found. It is noteworthy that these results were based on few samples in any areas of lesion, and results would change dramatically even by adding or subtracting one sample. In the present study, 96 patients, 54.2 (52%) men and 45.8 (44%) women, were included, with the mean age of 59.5 years. Most of OSCCs were of well-differentiated type. The most prevalent involvement sites were tongue mucosa in 43.8 (42%) patients and gingival mucosa in 22.9 (22%) patients. However, the study of Minhans et al. conducted on 81 patients reported a mean age of 52 years. They also reported the highest number of OSCCs to be of well-differentiated type. 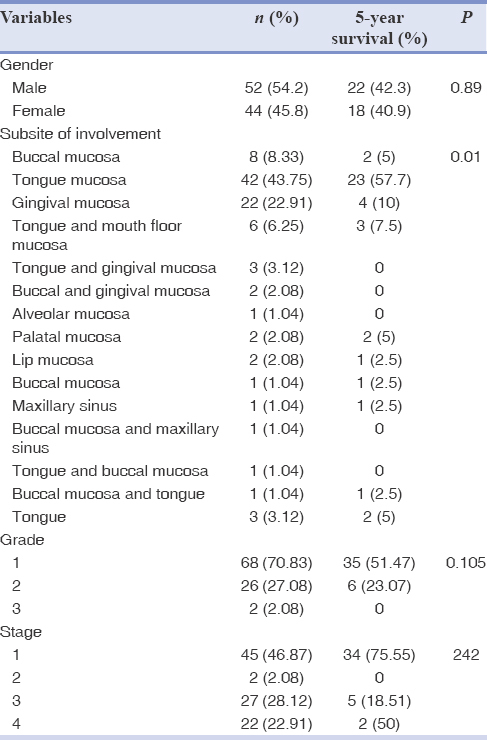 The maximum involvement site was tongue in 55.6 (45%) patients, followed by buccal mucosa, mouth floor, retromolar area, lip, and palate, respectively. In general, the findings of the current research showed the 5-year survival rate of 55% in men and 45% in women, with total survival rate of 41.7%. The 5-year survival rate of OSCC patients was affected by factors such as primary site of lesion, local recurrence, and regional and distant metastases. No statistically significant association was reported between the 5-year survival rate and stage and degree of disease. These results were in contrast with those of Noguti et al., as they found a relationship between survival rate and stage and degree of disease. Yang et al. reported the survival rate of patients with OSCC to be 80 months, with their 5-year survival of rate factors such as age, site, stage and recurrence were found to play a role in the survival rate of patients. Similarly, the present study showed the 5-year survival of rate, and according to Yang's study, the 5-year survival of patients was influenced by tumor site and local recurrence, not stage of disease. The findings indicated the 5-year survival of patients depending on diagnosis time, primary site of lesion, local recurrence, local and distant metastases, and metastasis site. Gender and degree and stage of disease had no effect on the 5-year survival of patients. Predictive results are hoped to be helpful in diagnosis and treatment of this disease. The authors would like to thank the Pathology Department of Dental School, Isfahan University of Medical Sciences, Islamic Azad University of Khorasgan Branch, for their kind support. Argiris A, Karamouzis MV, Raben D, Ferris RL. Head and neck cancer. Lancet 2008;371:1695-709. Brandizzi D, Gandolfo M, Velazco ML, Cabrini RL, Lanfranchi HE. Clinical features and evolution of oral cancer: A study of 274 cases in Buenos Aires, Argentina. Med Oral Patol Oral Cir Bucal 2008;13:E544-8. Wenguang X, Hao S, Xiaofeng Q, Zhiyong W, Yufeng W, Qingang H, et al. Prognostic factors of primary intraosseous squamous cell carcinoma (PIOSCC): A Retrospective review. PLoS One 2016;11:e0153646. Sakamoto Y, Matsushita Y, Yamada S, Yanamoto S, Shiraishi T, Asahina I, et al. Risk factors of distant metastasis in patients with squamous cell carcinoma of the oral cavity. Oral Surg Oral Med Oral Pathol Oral Radiol 2016;121:474-80. Suárez C, Barnes L, Silver CE, Rodrigo JP, Shah JP, Triantafyllou A, et al. Cervical lymph node metastasis in adenoid cystic carcinoma of oral cavity and oropharynx: A collective international review. Auris Nasus Larynx 2016;43:477-84. Gupta K, Panda NK, Bakshi J, Das A. To evaluate disparity between clinical and pathological tumor-node-metastasis staging in oral cavity squamous cell carcinoma patients and its impact on overall survival: An institutional study. South Asian J Cancer 2015;4:183-5. Kapoor C, Vaidya S, Wadhwan V, Malik S. Lymph node metastasis: A bearing on prognosis in squamous cell carcinoma. Indian J Cancer 2015;52:417-24. Iwata E, Hasegawa T, Takeda D, Ueha T, Kawamoto T, Akisue T, et al. Transcutaneous carbon dioxide suppresses epithelial-mesenchymal transition in oral squamous cell carcinoma. Int J Oncol 2016;48:1493-8. Sun HX, Feng H, Song Y. Expression of twist and relation with epithelial-Mesenchymal transition in oral squamous cell carcinoma. Hua Xi Kou Qiang Yi Xue Za Zhi 2015;33:534-8. Yin S, Fan Y, Zhang H, Zhao Z, Hao Y, Li J. Differential TGFβ pathway targeting by miR-122 in humans and mice affects liver cancer metastasis. Mol Cancer 2016;15:24. Hiratsuka S, Nakamura K, Iwai S, Murakami M, Itoh T, Kijima H, et al. MMP9 induction by vascular endothelial growth factor receptor-1 is involved in lung-specific metastasis. Cancer Cell 2002;2:289-300. Woolgar JA, Scott J, Vaughan ED, Brown JS, West CR, Rogers S, et al. Survival, metastasis and recurrence of oral cancer in relation to pathological features. Ann R Coll Surg Engl 1995;77:325-31. Moriya J, Daimon Y, Itoh Y, Nakano M, Yamada Z. Vegetative cardiac metastases of oral cavity cancer: An autopsy case report. J Cardiol 2004;44:33-8. Mess D, Songer M. Head and neck carcinoma metastases to the hand and foot. A case report of simultaneous involvement. Orthopedics 1986;9:975-7. Minhans S, Kashif M, Altaf W, Nagi A. Oral squamous cell carcinoma epidemiological, clinical and histological features. Rawal Med J 2016;41:81-5. Yang AK, Liu TR, Chen FJ, Ma XF, Guo ZM, Song M, et al. Survival analysis of 229 patients with advanced squamous cell carcinoma of the oral tongue. Ai Zheng 2008;27:1315-20.